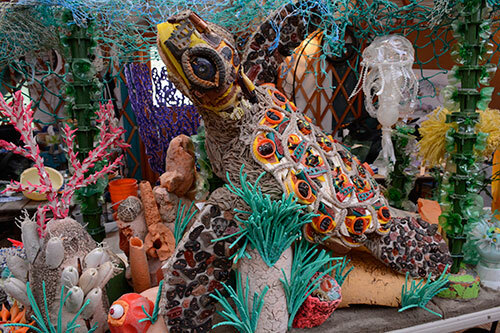 An art installation by Angela Haseltine Pozzi of the Washed Ashore Project composed entirely of marine debris, Turtle Ocean depicts an entangled Hawksbill turtle swimming in an environment of water bottle sea jellies and beached flip flop anemones along with marine debris seaweed and coral made of old buoys, crates and buckets. Hawksbill sea turtles face many threats, including mistakenly ingesting marine trash for food. All six species of sea turtles found in U.S. waters are threatened or endangered. Included in this display is a partially bleached coral reef depicted with faded plastics and polystyrene foam to raise awareness about the plight of coral reefs worldwide.